I've been eyeing these for a couple of years. Finally bought one, wish I did it sooner. I tried all the tricks to get the stock arm to work well enough, none were satisfactory. Its a beautiful thing to look at and use, and nearly perfect. I'm having so much more fun now playing and using the trem. What does it do that the regular one doesn't? The arm stays where I want it to, plus the height is adjustable. The original arm was too soft of a metal and got chewed up by the grub screw. I could never get it to stay where I wanted it to. I replaced it with a strat arm that I had ground off the threads on and put a small ball bearing between the grub screw and the trem arm. That setup actually worked fairly well but the angle of the arm wasn't quite right and the arm didn't move as smoothly I'd like. The Staytrem arm is just about perfect rather than something idiosyncratic that I learn to put up with. The Staytrem site says that their arm "isn't for heavy use" or something... does it feel like you shouldn't do loads of divebombs when you use it? My 66 and 72 Mustangs have no issues whatsoever, solid as a rock and the angle is perfect. I guess this fixes issues with the reissues. I've had a Compstripe reissue and a 69ri. I can't recall what the trem was like on them on them at all. Presumably the vibrato tailpiece itself is still an inaccurate POS though. "Giff me the Schkrillexth 'do today, Nanthy! Glathtonbury ith coming up"
I have an early 70's Mustang, tue trem is great guitars stays in tune fine. Tue only thing that does not work great is how the arm is held in. The screw always winds out and the arm falls out. 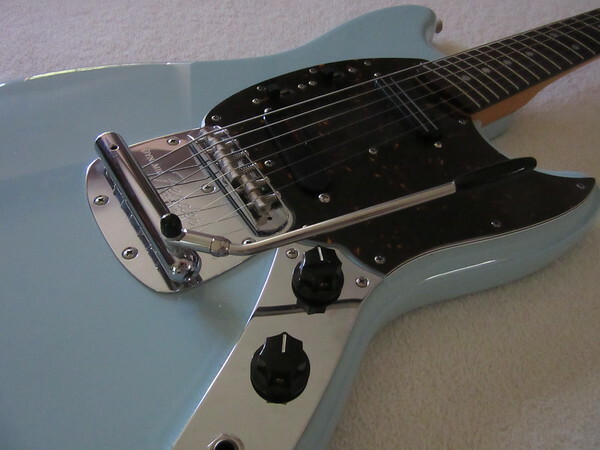 I'm thinking of wrapping some rubber tubing on the end of the arm to give some grip, otherwise I will prolly go for a staytrem, I have one in my 64 jag and its great. some people swear by the mustang trem, but have never felt it all that reliable, not on reissues or vintage. I guess there's something for everybody out there, because the Mustang vibrato system works great for me, stays in tune well enough if I don't go crazy on it, and the action is right. Really wanted to love the Mustang (love Miek/Stew's Compstang), but it's the one* trem I can't jive with - my hamfisted Santiago stylings just kept bending the whole thing out of tune all the time. * Haet Bigsbys too, but only because of the ACTIVATE SIEGE CATAPULT feel. Quite like the Mustang trem, I think because tie was the first trem that I spent ages using and learning with. I never had a problem with the arm in so far as eventually the grub screw bit a notch on the arm which meant it was always held exactly in the same place.